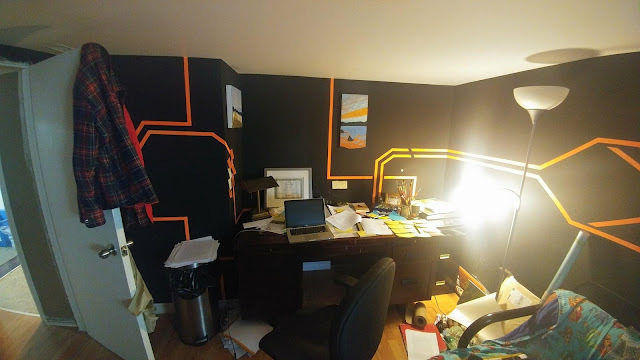 my (small press) writing day: Terry Doyle : My Writing Day. Terry Doyle : My Writing Day. It used to be that early mornings meant squinting my way through dressing in yesterday’s dirty work pants, a tattered hoody, and then hoping the lineup at the drive-thru wasn’t too long. I’d get to the shop, clean up the scrap metal bin, sweep the back room and wait to be dispatched to the first job of the day. Being a residential plumber isn’t so dissimilar to being a writer: it’s mostly problem solving. These days my mornings begin with my partner leaving for work, my son telling me he’s hungry, and feeling thankful that I’ve finally found the right role for myself. Cheerios poured, bagel toasted, coffee brewed, Burgess and I dress, step out into whatever manic meteorological concoction the North Atlantic has cooked up overnight, strap into the car, and off we go. Three days a week Burgess has daycare. Those are the days I write. I get six hours. Eighteen for the week, if I’m lucky and go uninterrupted. When I return home it’s straight to the basement. My “office” is quiet, painted black with some kind of Tron pattern in orange the previous owner surely worked hard to create, and there’s only one window. It looks out at nothing. If I’m honest, usually I’ll start with checking emails, Facebook, etc. But once that’s out of the way I can begin in earnest. Ideally I already know what I’m going to work on that day. It’s sitting face-up, urging me to dive back in. Some days – the most joyful days – are spent putting ink on paper, swelling Hilroy notebooks. But others are spent reading and rereading and editing typed material. When a state of flow is achieved lunch is inevitably forgotten. I’ll look up at 1:30 and know I should eat, but shrink away from the thought of time wasted preparing the food, let alone eating it, and the tendency to get sucked back into my phone’s distractions. I’ll just have a yogurt. The afternoon might require household tasks, part of the privilege that comes with being a stay-at-home parent. Very small price to pay. Laundry, dishes, kitty litter, sometimes they are catalysts for new ideas. Most often though they are just chores. 3pm I get back in the car to retrieve Burgess. I could go later, let him stay at Daycare until 5pm if I desired, but I miss him, and I need to prep dinner. Sometimes I can work a little after dinner, but mostly I find my mind less playful in the evenings. I become rigid and the best I can hope for is to do a little editing. And that is what my writing day looks like. I left out all the self-doubt and the fantasies about success. Those are ever present, writing day or not. But I should end by saying that those eighteen hours are such a privilege. This is the dream. While I’m in it lucidity isn’t always there, but when asked to think about it – thanks, rob! – it becomes obvious. I’ve found time, and it is the most precious thing I know. Besides Burgess. Terry Doyle is a writer from the Goulds, Newfoundland. Winner of the 2017 Percy Janes Award and finalist for the 2017 Fresh Fish Award, his work has appeared in Riddle Fence, Papermill Press, and Newfoundland Quarterly. Terry’s debut short story collection, DIG, is due in early 2019 from Breakwater Books. I'm never painting that room!